Do you love to read short fiction? I know I do! I have a tiny little problem with buying too many collections of short stories, and my TBR pile threatens to fall onto the floor. Fiction fans, I am excited to report that I was invited to join a fun reader’s resource, Curious Fictions. Curious Fictions connects readers to authors whom they already love, and makes it easy to discover new favorites. Readers can enjoy, “like,” and share stories. They can also tip and subscribe to the writers of tales or serialized novels that move & entertain. One can search stories by genre (from literary fiction to science fiction and fantasy to satire) or by author’s name. It’s easy and cool. I am already subscribing to the work of two writers whom I admire, and I bet I will follow more in the future. Thanks for helping me spread the word about my fairy tale and the world of Curious Fictions, wonderful readers! 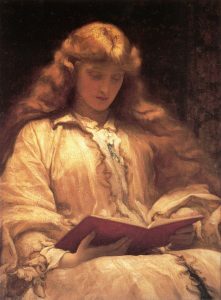 Picture from the painting The Maid with the Yellow Hair by Frederic Leighton (public domain use).